In 1816, representatives of the Council of the Three Fires (the united Ottawa, Ojibwa and Potawatomi) were deceived into signing a treaty by which much of today’s northern Chicago became property of the United States. This treaty targeted a twenty-mile wide tract of land connecting the shores of Lake Michigan with the Illinois Purchase. It was one of many political operations in response to directives from Congress for securing “safe passage” for white traders between territories that were already occupied. Native peoples had long been using the Chicago purchase as a carrying passage, a low divide between the waters of Lake Michigan and the Des Plaines River which was part of a system of passages connecting Lake Michigan to the Mississippi Delta. The treaty—and the territory it established—had to do with occupying and enclosing trade routes. Enclosure is as much about exclusive ownership of land as it about exclusive access to mobility. So in 1816, a border separating “America” from “Indian lands” was established via the Indian Boundary Line, a diagonal line running from the shore of Lake Michigan, down what is today Rogers Avenue, extending all the way through Bolingbrook. On a map, a border is drawn as though permanent, as through somehow given and stable. But this border, as all borders, is a historical process, not merely a line. It is part of the continuous making of “America”—as a territory, a system of laws and a social order, which are meant to appear given, permanent and natural. Treaty-making and border-making are part of a history of violent displacement which they also work to erase. By 1848 the Illinois and Michigan Canal, the first transportation infrastructure to secure Chicago’s control over continental trade routes, was built along this boundary line; not coincidentally, the Chicago Board of Trade was opened in the same year. Together, treaty and border make the translation of land into property, and of movement into trade seem inevitable. 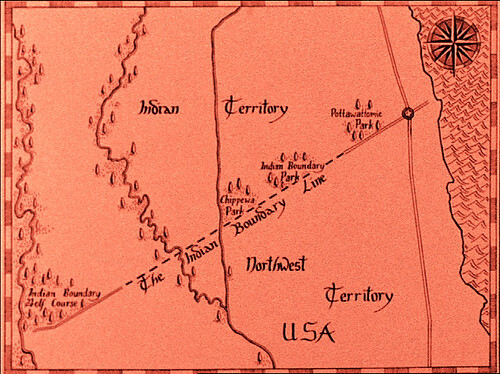 Drawing by Dominique Holmes from the film The Indian Boundary Line by Thomas Comerford (full size). I was walking along Rogers Avenue after watching The Indian Boundary Line, an experimental documentary by Chicago filmmaker Thomas Comerford. It is a film that insists on a kind of recalibration of our senses our capacity to listen, to see, and our pace for apprehending the world. The film invites us to pay attention differently, to question what appears as given. My experience of navigating Rogers Avenue, and of navigating this issue of AREA, has been continuously recalibrated by an acute awareness of the colonial settler-state, by a sense that we are part of historical processes of settling that only appear to be finished, yet which are continuously unfolding in the present, through us. This perspective can at times help me bring the constructedness of this city into sharp focus—but it can also make me feel disoriented in otherwise familiar terrain. I am an immigrant-settler and relative newcomer to Chicago, a bit overwhelmed by the city’s exemplary forms of segregation along racial and “ethic” lines. For me, working on this issue of AREA has been as much about the texts in these pages as it has been about learning from personal encounters, about the struggle to form relationships across vastly different social realities. How can we make sense of the ways in which structures of inequality are not somehow natural or given, but instead are made, even while this making is hidden by both right-wing politics of criminalization as well as liberal understandings of “diversity” and “difference”? Who is made to be in place or out of place in the movement of populations, resources and borders? Whose arrival is seen as legitimate, who is “white on arrival”? The myth of Chicago as a city of immigrants in a nation of immigrants glosses over the erasure of indigenous presence—but it also celebrates a generic notion of undifferentiated arriving that doesn’t help us confront the borders within the city and the inequalities they encode. As Robin Hewlett and I worked with contributors for the issue, we also worked to develop new relationships, solicit other perspectives, and to learn how AREA might become relevant to people and organizations not already familiar to us. Part of this process was one-to-one meetings, but it also resulted in a series of discussion events, an art exhibition and video screening, a sidewalk cookout and encuentro, and it also extends into media production online. It has also brought us into collaboration with Calles Y Sueños, a collective, experimental space and political project that is both highly localized and transnational in scope. Their work spans almost two decades of cultural and pedagogical practice addressing migration, grass-roots politics and community in Chicago. In the more recent stages of the editorial process, we looked for provocative and useful ways to organize the final text contributions by grouping them into clusters. We responded in part to our own need to unsettle understandings of the (American) nation-state as the given and seemingly inevitable frame of reference. We also responded to more or less obvious, and sometimes surprising, connections and tensions emerging between different contributions. The sections of the issue raise a set of questions. How do borders stretch across social life at all scales, and how does the apparent “order of things” encode but also conceal extreme power differentials? How can we make sense of the highly differentiated ways in which people move or are forcefully removed, and how do migrant communities articulate belonging and endurance in relation to place? How can we understand the relationship of enclosure to mobility and rupture to continuity? How do people create political change in and through their own lives? As we navigate these pages, I invite you to extract your own questions beyond what we have tried to offer, and to share your own frameworks for orientation—and disorientation—through the issue, the topic and the city.